Precise numbers are not known but various craftsmen have probably built more Grunau Babies and Baby derivatives than any other sailplane. Thousands were constructed in western Europe between 1931 and 1945. During World War II, factory records show that 4,104 rolled from workshops in Germany and the occupied countries. After the war, thousands more were built in Czechoslovakia, Spain, Sweden, Great Britain, and Australia. The Grunau Baby also influenced the development of other sailplanes such as the Slingsby Kirby Kite, Slingsby Cambridge 1 and 2, and the Slingsby Type 21 two-seat trainer. May 1, 1949, marks the date when the U. S. Air Force officially transferred the Grunau Baby II B-2 to the custody of the National Air Museum. Very little is known of the glider's operational history. According to the data plates secured to the bulkhead behind the pilot's seat, this glider was built in 1944 at the Petera Hohenelbe l/Rsgb. workshop factory. The airframe serial number is 031.016 and the Stammkenzeichen, or registration code, LZ-NC is painted on both sides of the fuselage. Edmund Schneider designed the Grunau Baby and built the first examples at his factory near the village of Grunau, in the Silesia region of eastern Germany. Today, this area is part of western Poland and Grunau is called Jesow. Schneider built the first Baby in 1931. It was a smaller version of the ESG 31 Stanavo, a sailplane designed during the same year for American pilot Jack O'Meara. Schneider used an innovative wing design patterned after the elliptical wings used on the high-performance sailplanes designed by the Academic Flying Group of the Darmstadt Technical University, the Akaflieg Darmstadt. Schneider's wing held a constant chord from the root to the aileron, and then the leading and trailing edges tapered to a rounded wingtip. To maintain control during a stall, Schneider designed the outboard wing and aileron with washout, or twist. On a wing with positive washout, the trailing edge of the wing curves up near the tips when viewed from the rear. 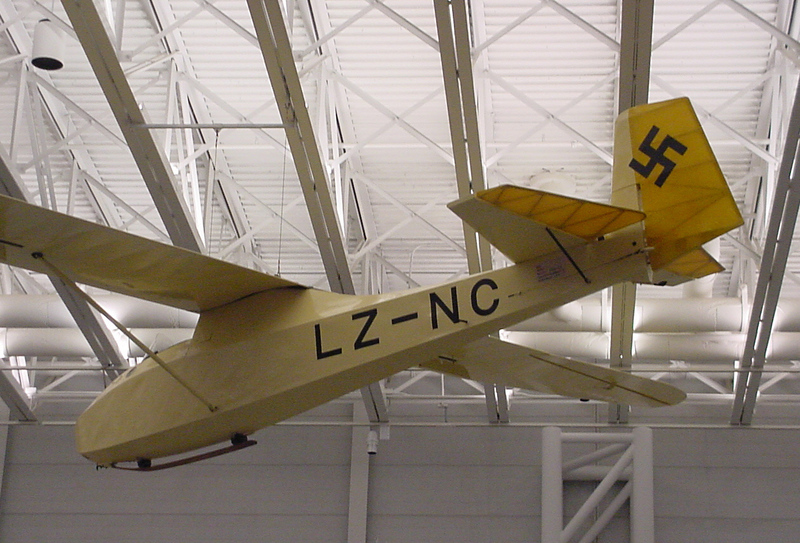 The German glider champion, Wolf Hirth, had nothing to do with designing the Grunau Baby. However, he lent his name to the Baby sales campaign and for some time, many thought he was the designer. This was easier to believe because the glider handled well in the air and exhibited good performance. The factory at Grunau began to hum steadily to fill a stream of new orders. The fatal crash of another Schneider sailplane at the 1932 German national soaring contest in Bavaria compelled Schneider to hire a professional aeronautical engineer, Emile Rolle who redesigned the Baby from nose to tail. This new version was called the Grunau Baby II. Among its many improvements, the Baby II had a longer wing, reshaped rear fuselage, and a shorter rudder. On April 3, 1933, Kurt Schmidt soared a Baby II all day, all night, and into the next day without landing. He had remained aloft for 36 hours and 36 minutes, a new world endurance record for motorless airplanes. The news electrified the world and for the next ten years, Grunau Baby II production continued without pause. Schneider continued to refine the airplane and introduced the Baby II A and the definitive II B. The II A introduced a wing of slightly greater span to accommodate spoilers for glidepath control, ailerons with a narrower chord, and for the first time, a canopy and windscreen for the cockpit. When the Baby first appeared, it was accepted wisdom that the pilot should feel as much unimpeded airflow as possible, the better to sense rising and falling currents of air, temperature changes and the like. On the II B, Schneider changed the spoilers to the more powerful Schempp-Hirth, 'parallelogram' configuration and added a wheeled launch dolly that the pilot jettisoned immediately after takeoff. Other versions followed but more Grunau Baby II B gliders were built than all other variants combined. The Baby II B was nearly a perfect club sailplane. It was relatively easy to build from plans, it flew well, and the aircraft was strong enough to handle mild aerobatics and the occasional hard landing. Novice pilots could attempt their first real soaring, flying high and far, using updrafts generated by slopes and mountain ridges, and spiraling columns of warm air called thermals. Many Grunau Baby II B pilots achieved the coveted Silver-C soaring badge introduced in 1930. This required a pilot to remain aloft at least five hours, gain a minimum of 1,000 m (3,280 ft) after takeoff, and cover a horizontal distance of 50 km (31 miles). Fleets of Grunau Baby II B sailplanes served as primary flight trainers operated by the Deutsche Luftsport Verband (German Sport Flying Organization, the DLV) created in 1933. The DLV became the Nationalsozialistiche Fliegerkorps (NSFK) in 1937. The Nazi political machine operated both organizations to train military pilots without appearing to violate the post-World War I Versailles Treaty that outlawed such remilitarization. Many of the Luftwaffe (German Air Force) pilots that flew during World War II first trained in Grunau Babies. May 1, 1949, marks the date when the U. S. Air Force officially transferred the Grunau Baby IIb to the custody of the National Air Museum. Very little is known of the glider's operational history. According to the data plates secured to the bulkhead behind the pilot's seat, technicians built this glider in 1944 at the Petera Hohenelbe l/Rsgb. workshop factory. The airframe serial number is 031.016 and the Stammkenzeichen, or registration code, LZ-NC is painted on both sides of the fuselage. Details about how the U. S. Army Air Forces (AAF) recovered the glider are also unknown. For tracking purposes, the AAF assigned the inventory control number T2-2600. T2 signified the Technical Intelligence branch of the AAF and 2600 refers to the number of this particular item. Beginning in the final months of the war, teams of Technical Intelligence personnel scoured Germany and recovered aircraft and pieces of equipment for study and evaluation. Simons, Martin. "The World's Vintage Sailplanes, 1908-45." Melbourne, Australia: Kookaburra Technical Publications Pty., Ltd.: 1986. ----. "Sling's Sailplanes," "Aeroplane Monthly," December 1992, 25. Grunau Baby II B-2 curatorial file, Aeronautics Division, NASM. Wooden airframe covered with fabric, steel and aluminum hardware.